And people complain that Clara Oswald is overrated and awful. In my opinion, Just let Rose go. She left I ‘Doomsday’ and came back in Turn Left (al of which was explained). Billie returned as The Bad Wolf/The Moment entity. Just let her stay in the past. I really don’t see the point. It just shows that Billie Piper canrpt find any acting jobs at the moment. I’d be more interested in seeing (or hearing) a Donna Noble spin-off set before ‘Partners in Crime’ as Donna explained to the Doctor when she was searching for him, that she was constantly looking for weird goings-on to try and locate him. That would be Billie piper, multi award winning stage actress is it? Fascinates me that people forget that just because an actor isn’t on the tv it doesn’t mean they are out of work! A good example is Colin baker who has a huge amount of stage work compared to tv. I’ve a suggestion for whovian, just don’t buy the cd’s. Also, by your own argument, that means you must think tom baker, peter davison, colin baker, Sylvester mccoy, Paul McCann, David tennant and virtually every other big finish actor “can’t get any other acting jobs at the moment”. Remember that to an actor these audios are relativity easy to fit into a schedule only taking up a small amount of time to record and they don’t all need to be there at the same time making it a lot easier to do these kind of stories where lots of old cast members are reunited. 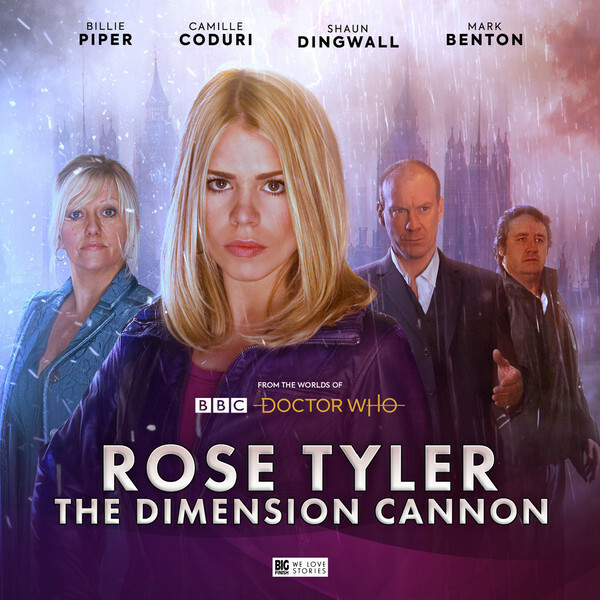 Personally I loved Billie as rose, but I have no interest in big finish cds these days so I just won’t buy it. Judging by other comments though other people are very pleased about this release and I hope they enjoy them. Kinda bummed that Mickey isn’t in this. I’m sure his absence will be explained but hopefully he’s in the next one. I knowhe eventually ended up with Martha but this seems to be set between Doomsday and Turn Left. Mickey left after that, so he should be here in this set. Yeah and where is Tony Piper as well. At the end of Doomsday, Rose says her parents gave birth to Tony. I mean he’s probably a 2 year old at Stolen Earth/ Journey’s end. But knowing how dangerous Parallel Earth(and Earth are), they probably wouldn’t get a babysitter because if there is an invasion, they won’t know if Tony is save. They can just get a 2year old to talk every now and then. Where is Mickey and Tony? I’d rather this than another New Earth box set, and it is the original cast rather than impressionists… But I prefer classic Who tbh. “Doctor Mysterio” was the title of the show when it aired in Latin America in the 1960s, the Christmas Special title was a reference to it. Just seems a bit silly to call yourself that when most people will associate that name with New Who rather than Classic. But hey, you do you, dude. I mean I prefer the Classic Who Big Finish releases to those from the new series. On TV I love both! How are there poeple unhappy with this? Rose was literally the best! Because they have opinions. She wasn’t “literally” the best; just in your opinion, which is perfectly fine. I’m happy that you’re happy. But personally, I can see why people feel this is a bit much. For the record, I’m on the fence with this one. @whovian how can you say Ryan Sinclair is one of the best companions ? He’s only been in 8 episodes and to be fair he wasn’t very good in any of them. I respect that it’s your opinion but I think your earlier criticism of Billie Piper was a bit harsh. They’ve hardly rated Ryan as one of the best, they’d got him pretty low. No.8 out of the many dozens of companions that have appeared on the show, which is pretty high. Its far too many which is why i think people are annoyed. It just spoils the mystery of doctor who if you fill in all of the blanks with audio adventures and their not exactly cheap either. I understand the money that goes into making these but surely they need to limit it down a bit. The next thing you know, we will find out what the creature in midnight was. Basically, they need to prioritise more as no normal person can afford all the stuff they are bringing out. I know, I stopped buying any big finish stuff 6 years ago. Too many, too expensive and took up too much of my life trying to listen to it all! Very excited to listen to this. I am not normally a fan of the Big Finish Audios ( I tried the Torchwood Ones but couldn’t get into it) but I would absolutely love to hear Rose Tyler return to the universe of Doctor Who in her own Spin-Off. Truly One of my Favourite companions !!!! Can’t wait to hear Billie & co return !!! I am very happy with the sound of this release !!! It’s only telling in terms of that eras actors are available and willing to reprise their roles. Probably in the minority but I’d love an Eric Roberts master box set. Yeah, they are starting to take it a bit far now. At the moment I think they’re still exploring stuff that’s worth it (Time War, Paternoster Gang, Jenny, this [so long as this is the only volume]) and being a shameless Clara fanboy I wouldn’t mind seeing them do something with her (either standalone stories focusing on some of her echoes meeting Classic Doctors, or her post-“Hell Bent” adventures) but I do think if they try to go too far beyond all that they will start to ruin things. Just look at the amount of Time War stuff they’re doing. I mean, I love it all, but they really shouldn’t try to do any more. 8th Dr Time War, War Doctor, War Master, Gallifrey Time War – that’s more than enough now. I’m happy with what they’ve covered so far, and being a shameless Clara fanboy I wouldn’t mind some stuff with her in her TARDIS, or maybe her echoes meeting Classic Doctors, but that I think would be the limit of all the stuff that would be worth covering. This release should be okay so long as it’s the only volume – any more than that would be too much. They’re certainly pushing it with the amount of Time War stuff they’re doing now. That definitely needs to stop before it goes too far. Gordon – I would love that too. Long overdue in my opinion! Finally, Rose Tyler: Earth Defence has materialised! It’s about time! The BBC were actually going to make a spin off about Rose, but it never got made. Big finish knows how to impress their audience, cause I’m happy with this. Come on…only Big Finish boxset I’m not getting. Terrible character. Rather have someone like Donna Noble. But how’d you make a spin off about Donna ? Sorry, but I think this is a spin-off too far. The only new series box set we need right now is L.I.N.D.A. No one wants that… We actually want Rose. Sorry i didnt realise you were the spokes person for us all… I have seen so many people want a LINDA spin off from BF and so do I. At last. The spin off I wanted so much. Rose. + Family+ In search for the Doctor. = Pre order sale. Huge thank you to Big Finish, chasing all these busy actors,to get recording dates together. And Billie, Camile and Shaun. And Clives Back. More Mark Benton,always a joy to watch /listen to him. Very Happy monday after the big Birthday Friday. Hopefully one day they can bring Jake back into future volumes; I’ve always found it odd he just vanished after Rose got pulled into the parallel earth in Doomsday. Also maybe an alternate universe Gwen Cooper as well?